D.N.B, DM - Pulmonary Medicine, M.B.B.S. Dr. Aditya Jindal, MBBS, DNB(Medicine), DM(Pulmonary & Critical Care Medicine), is a Consultant- Pulmology at Jindal Clinics, Chandigarh. 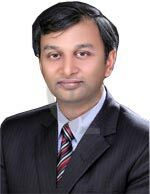 A Native of Chandigarh, Dr. Aditya Jindal received training in General Medicine at the eminent Delhi Sir Ganga Ram Hospital and obtained his postgraduate DNB (Medicine) from the National Board of Examinations. After working as a Senior Resident in the Department of medicine at the Prestigious Post Graduate Institute of Medical Education and Research, Chandigarh, he joined the postdoctoral course in the Department of Pulmonary Medicine in the same institute and was awarded the degree of D.M. Pulmonary & Critical Care Medicine in June 2013. Dr. Jindal is fully trained in all interventional bronchoscopic procedures including endobronchial and transbronchial biopsies, bronchoalveolar lavage and conventional transbronchial needle aspirations. Likewise he is trained in advanced bronchoscopic techniques such as argon plasma coagulation, endobronchial electrocautery and cryotherapy. He has also undergone training in the field of sleep medicine and lung cancer chemotherapy. He has assisted and independently performed over 100 cases of endobronchial ultrasound (EBUS) guided transbronchial needle aspiration. To his credits, Dr. Aditya has extensive experience in the field of critical care medicine including ventilatory management, intubation, central venous cathererization, percutaneous trancheostomy, critical care thoracic ultrasound and other ICU procedures.